Bermondsey Abbey, which was more than 130-years-old by the time King John put his seal to the Magna Carta in 1215, has an unusual connection to the unpopular king – it is one of a number of buildings in London which has, at various times in history, been erroneously referred to as King John’s Palace. This suggestion – that it was a palace which was later converted into an abbey – may have arisen from a site on the former abbey grounds being known at some point in its history as King John’s Court (that name was said to commemorate the fact that King John visited the abbey). Putting how King John’s name came to be linked with the abbey aside, we’ll take a quick look at the history of the abbey which rose to become an important ecclesiastical institution in medieval times. While there was a monastic institution in Bermondsey as far back as the early 8th century, the priory which was here during the reign of King John was founded in 1082, possibly on the site of the earlier institution, by a Londoner named as Aylwin Child(e), apparently a wealthy Saxon merchant who was granted the land by King William the Conqueror. 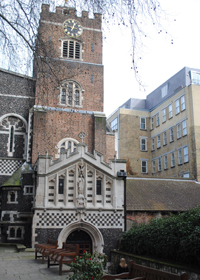 In 1089, the monastery – located about a mile back from the river between Southwark and Rotherhithe – became the Cluniac Priory of St Saviour, an order centred on the French abbey of Cluny, and was endowed by King William II (William Rufus) with the manor of Bermondsey. It was “naturalised” – that is, became English – by the first English prior, Richard Dunton, in 1380, who paid a substantial fine for the process. It was elevated to the status of an abbey by Pope Boniface IX in 1399. It had some important royal connections – King John’s father, King Henry II and his wife Queen Eleanor celebrated Christmas here in 1154 (their second child, the ill-fated Henry, the young King, was born here a couple of months later), and Queen Catherine (of Valois), wife of King Henry V, died here in 1437. It was also at Bermondsey Abbey that Elizabeth Woodville, the widow of King Edward IV and mother of the two “Princes in the Tower”, died in 1492 following her retirement from court. The abbey, which grew to have an enormous income thanks to its acquisition of property in a range of counties, survived until the Dissolution when, in 1537, King Henry VIII closed its doors. It was later acquired by Sir Thomas Pope who demolished the abbey and built a mansion for himself on the site (and founded Trinity College in Oxford apparently using revenues from the property). We’ll deal more with its later history in an upcoming post. 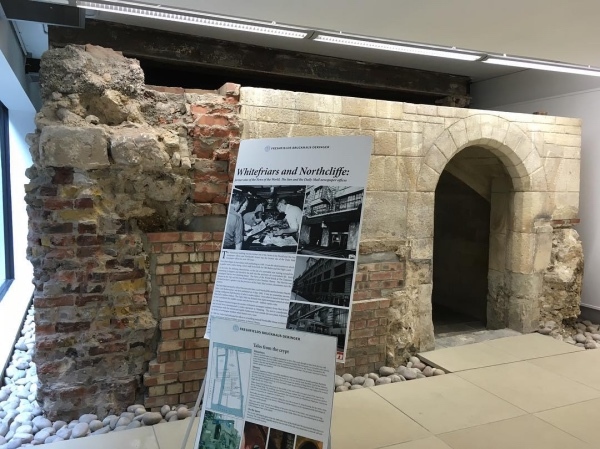 The ruins of the abbey were extensively excavated in the past few decades and some of the remaining ruins of the abbey can still be seen buildings around Bermondsey Square and a blue plaque commemorating the abbey was unveiled in 2010. 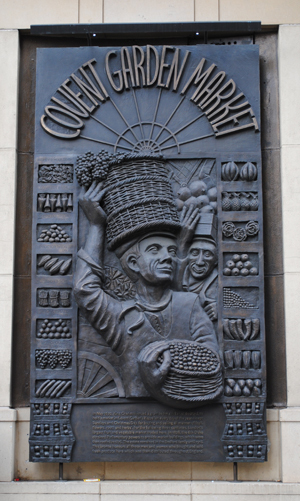 Bermondsey Street runs roughly along the line of the path which once led from the abbey gates to the Thames and the abbey had a dock there still commemorated as St Saviour’s Dock. The abbey’s name is commemorated in various streets around the area. For more on the history of the Magna Carta, see David Starkey’s Magna Carta: The True Story Behind the Charter . 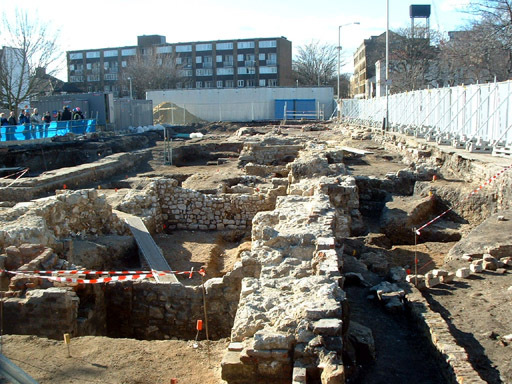 PICTURE: An archaeological dig at the ruins of Bermondsey Abbey in 2006. Zefrog/Wikipedia. 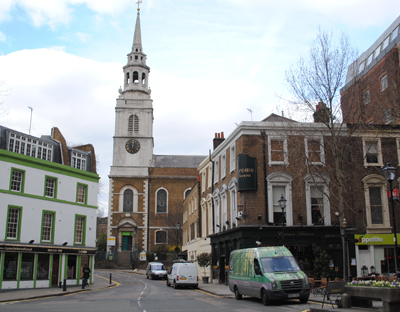 Located on the site of the former Blackfriars Monastery which has closed during the Dissolution (see our earlier post here), the origins of the Blackfriars Playhouse or Theatre go back to the mid-1570s when children connected with the Queen’s Chapel Choir performed plays in part of the former monastery. While those plays were performed in order to practice for those performed before Queen Elizabeth I, the organisers did also apparently use the theatre for paying audiences. This first theatre ceased operation in 1584. In 1596, part of the priory and an adjoining building were bought by James Burbage in 1596 who created a playhouse within them. 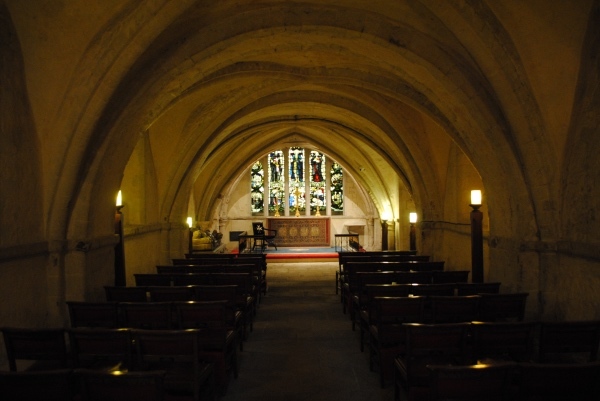 It was used by the Children of the Chapel, a group of choristers and other boys, until 1608 when the King’s Men took over – with Burbage’s son Richard and Shakespeare among those who had a share in the theatre – and used it as their winter playhouse. The theatre – where Shakespeare himself is believed to have performed – was apparently the first commercial premises of its type to used artificial lighting and, usually for the time, featured music between acts. The wife of King Charles I, Queen Henrietta Maria, is known to have attended the theatre later in its life in 1634 and again a couple of years later. 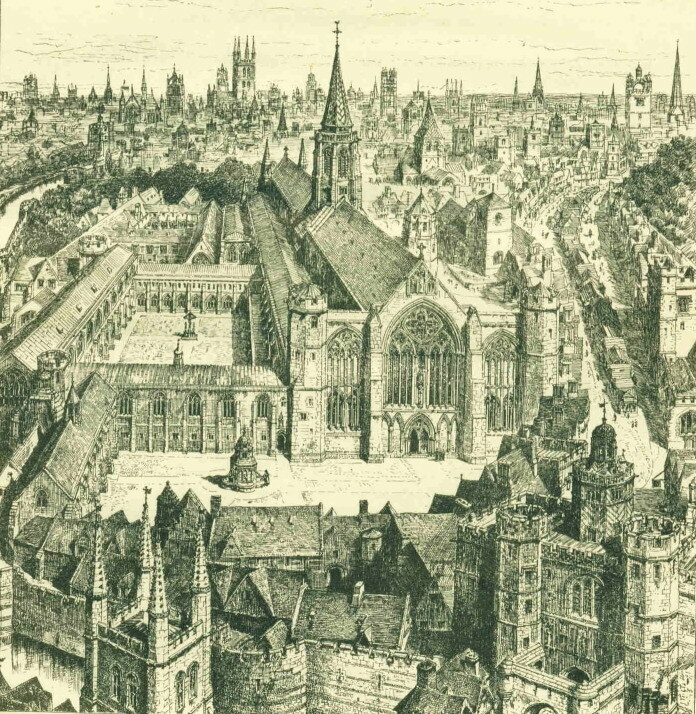 The theatre closed with the commencement of the English Civil War and the theatre was demolished in 1655. The candle-lit Sam Wanamaker Playhouse, which opened in January at the Globe Theatre on Bankside, was designed based on drawings of indoor theatres of the era (there’s also a recreation of the Blackfriars Playhouse in the US which is home to the acting troupe of the American Shakespeare Center). While nothing remains of the playhouse today, it lives on in the name Playhouse Yard. 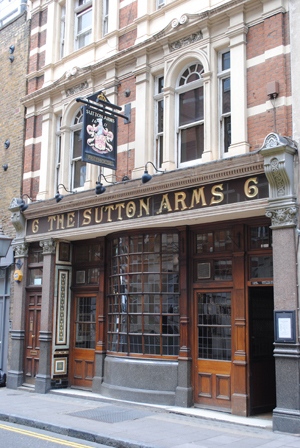 Located close to Tower Hill in the eastern part of the City, this pub – and indeed the street in which it sits (at number 64-73) – takes its name from a former nunnery that was once located here. 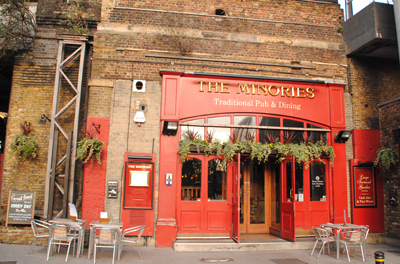 Known as the Minoresses, the nuns – who belonged to the Order of St Clare (also known as the Poor Clares) – lived in a nunnery here. The institution was founded by in 1293 by Edmund, the brother to King Edward I (reigned 1272-1307), and the earl of Lancaster, Leicester, and Derby, to house nuns who had been brought to England from Spain by the earl’s wife, Blanche of Artois, the widow of King Henry I of Navarre. 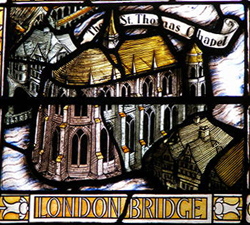 As with the case of the Black Friars, the name came to be used to refer to the district in which the now long-gone nunnery once stood (it was dissolved in the Great Dissolution and later used as a residence by the likes of Henry, Duke of Suffolk and father of Lady Jane Grey) and lives on in the name of the street and the pub. 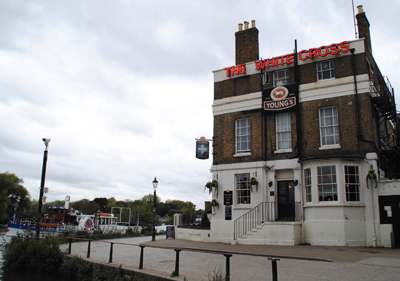 The pub, which has undergone a paint job since our picture was taken, is located under a railway bridge (and may have once been part of the former Minories Railway Station which closed in 1873. For more, see www.minories-london.co.uk. 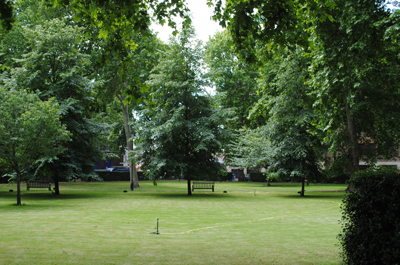 The final in our series on historic garden squares in London (for this year, anyway), we’re taking a look at Charterhouse Square. 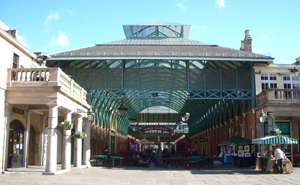 The five sided square, located just to the east of Smithfield, takes its name from a Carthusian monastery which was established in 1371 on what is now its north side. Prior to this, what is now the square had from 1348 served as a location for a plaque burial pit (a number of skeletons from the plaque pit have been unearthed as part of the Crossrail project – for our earlier story on this, follow this link). The monastery was dissolved in 1537 after the monk’s refused to recognise King Henry VIII’s Act of Supremacy (some were later executed at Tyburn) and it was subsequently transformed into a manor house with Thomas Howard, the 4th Duke of Norfolk, among its residents over the years (in fact he was imprisoned there around 1570 for allegedly plotting to marry Mary, Queen of Scots – he was later executed by Queen Elizabeth I for treason). Under the will of Thomas Sutton, an almshouse and school was subsequently established on the site – the almshouse remains there while the school, whose students had included Methodism founder John Wesley and writer William Makepeace Thackeray, moved out to Godalming in Surrey in 1872. As well as the almshouse (which is open for guided tours, check this site for details), some of the buildings are now occupied by medical related institutions. In the 1600s, the square was also home to numerous other large residences among them Rutland House, which had been the residence of the Venetian ambassador. It lost its aristocratic inhabitants in the ensuing centuries but remained mainly residential up until the late 19th century when it gradually became taken over by businesses and other organisations. Interesting to note is that the east side of the square is still home to the residential unit complex known as Florin Court, better known as Whitehaven Mansions, the home of Hercule Poirot in the TV series which bears his name. 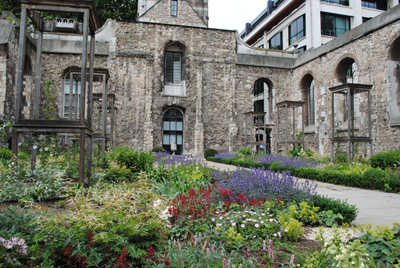 The area of the garden square itself was variously referred to as the Charterhouse Churchyard, the Charterhouse Yard and Charterhouse Close over the years and has gone through numerous incarnations with efforts to improve and formalise its look dating back to at least the 16th century. It was at least partly enclosed by the late 1600s and the fences replaced several times, notably in 1742 when an Act of Parliament was passed allowing residents to fine those who entered without authorisation. The enclosing fences have since been modified several more times. One of the major changes to the shape of the square occurred in 1860 when the Metropolitan Railway was extended between Farringdon and Moorgate. It was at this time that the road surface which surrounds the central garden, which has a Grade II heritage listing, was laid down. Today the gardens in the centre of the square remain under the management of the Charterhouse (and hence aren’t open to the general public except on tours) but even without a tour it’s still a quiet place to walk around the outside of, evoking a strong sense of years gone past. This stunning early medieval casket, dating from around 1180-1190, commemorates one of the most infamous events of the Angevin era – the death of Thomas Becket, Archbishop of Canterbury, who was murdered in Canterbury Cathedral on 29th December, 1170, by four knights of King Henry II. The murder – for which the king undertook public penance (although whether he ordered the death of Becket, his former chancellor and friend, remains a matter of some dispute) – provoked outrage across Europe and pilgrims soon started flocking to Becket’s tomb. So much so that the Archbishop was canonised in 1173 and in 1220 a richly decorated shrine was created to house Becket’s remains and serve as a focal point for pilgrims (a pilgrimage to Becket’s shrine is at the heart of Geoffrey Chaucer’s A Canterbury Tale). The shrine was eventually destroyed in 1538 on the orders of King Henry VIII during the Dissolution of the Monasteries. 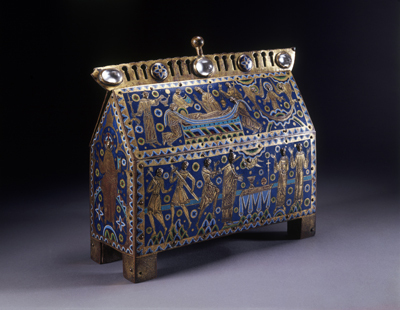 The beautiful Becket Casket, made of Limoges enamel, depicts, among other things, Becket’s murder, subsequent burial and the ascension of his soul to heaven. On the rear are four long-haired figures who may represent saints or the Cardinal Virtues of Prudence, Justice, Fortitude and Temperance. One of more than 40 examples still in existence (the British Museum also has one), it was probably made for an important religious house and may have been used to contain relics of the dead saint. It can now be found in the collection of the V&A’s Medieval and Renaissance Gallery at the museum’s premises in South Kensington. WHERE: Room 8 (case 20), Victoria & Albert Museum, Cromwell Road, South Kensington (nearest Tube Stations are South Kensington and Knightsbridge). WHEN: 10am to 5.45pm daily (Fridays until 10pm – select galleries after 6pm); COST: Free; WEBSITE: www.vam.ac.uk. For more on Thomas Becket, see John Guy’s book Thomas Becket: Warrior, Priest, Rebel, Victim: A 900-Year-Old Story Retold . This well-to-do area in London’s north-west, just outside Regent’s Park, takes its name from the historic ownership of land here by the Order of St John of Jerusalem (also known as the Knights Hospitaller). The land had previously been part of the Great Forest of Middlesex. The Order of St John of Jerusalem, which since 1140s had its English headquarters in a Clerkenwell priory where St John’s Gate stands (this now houses the Museum of the Order of St John – see our previous entry here), took over ownership of land in the early 1300s after the previous owners, the Knights Templar, fell into disgrace. Following the Dissolution, it became Crown land and remained so until 1688 after which it passed into the hands of private families, notably the Eyre family who owned much of the area. It remained relatively undeveloped until the early 19th century when, following the introduction of semi-detached villas on planned estates, it was marketed as a residential alternative for London’s middle classes, away from the smog and congestion of central London. It became favored by the bohemian set and residents included creative types like artists and authors as well as scientists and traditional craftsmen (apparently in the late 19th century it was also known for its upmarket brothels). Rebuilt with swanky apartment complexes in the early twentieth century, these days it remains a leafy enclave for the wealthy. Many of the houses which have survived are heritage listed. 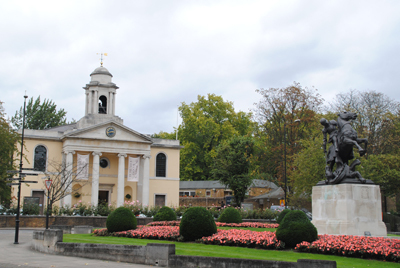 Landmarks include St John’s Church (pictured above, this was consecrated in 1814) and the St John’s Wood Barracks and a Riding School (this was completed in 1825 and is the oldest building still on the site) which is now home to the King’s Troop Royal Horse Artillery which carries out mounted ceremonial artillery duties such as firing royal salutes for the State Opening of Parliament, royal birthdays and state visits. St John’s Wood is also home to Abbey Road Studios (home of the Beatles and that famous zebra crossing), Lord’s Cricket Ground (officially the home of the Marylebone Cricket Club which was moved here in 1814, the same year the church was consecrated) and the Central London Mosque located on the edge of Regent’s Park. For more on St John’s Wood, take a look at the website of The St John’s Wood Society. This year marks the 160th anniversary of the transfer of the care of the Royal Parks to the government (meaning the public was freely able to enjoy access for the first time). To celebrate, over the next weeks we’ll be taking a look at the history of each of them. 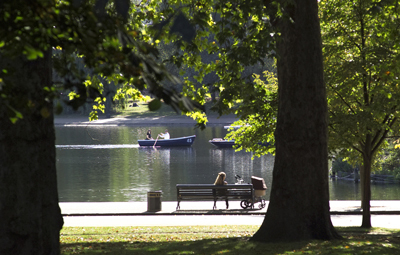 First up is the 142 hectare Hyde Park, perhaps the most famous of all eight Royal Parks. Formerly owned by Westminster Abbey, King Henry VIII seized the land in 1536 for use as a private hunting ground. He had it enclosed with fences and the Westbourne Stream, which ran through the park – it now runs underground – dammed. It remained the king and queen’s private domain (Queen Elizabeth I is known to have reviewed troops there) until King James I appointed a ranger to look after the park and permitted limited access to certain members of the nobility in the early 17th century. The park’s landscaping remained largely unaltered until the accession of King Charles I – he created what is known as the ‘ring’ – a circular track where members of the royal court could drive their carriages. In 1637, he also opened the park to the public (less than 30 years later, in 1665, it proved a popular place for campers fleeing the Great Plague in London). During the ensuring Civil War, the Parliamentarians created forts in the park to help defend the city against the Royalists – some evidence of their work still remains in the raised bank next to Park Lane. 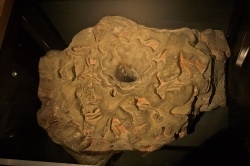 After King William III and Queen Mary II moved their court to Kensington Palace (formerly Nottingham House) in the late 1600s, they had 300 oil lamps installed along what we know as “Rotten Row’ – the first artificially lit road in the country – to enable them and their court to travel safely between the palace and Westminster. The natural looking Serpentine – the great, 11.34 hectare, lake in the middle of Hyde Park (pictured) – was created in the 1730s on the orders of Queen Caroline, wife of King George II, as part of extensive work she had carried out there. It was Queen Caroline who also divided off what we now know as Kensington Gardens from Hyde Park, separating the two with a ha-ha (a ditch). The next major changes occurred in the 1820s when King George IV employed architect and garden designer Decimus Burton to create the monumental park entrance at Hyde Park Corner – the screen still remains in its original position while Wellington Arch was moved from a parallel position to where it now stands (see our previous posts for more on that). Burton also designed a new railing fence and several lodges and gates for the park. A bridge across the Serpentine, meanwhile, was built at about the same time along with a new road, West Carriage Drive, formally separating Hyde Park and Kensington Gardens. While the basic layout of the park has been largely unchanged since, there have been some additions – among them, the establishment in 1872 of Speaker’s Corner as a place to speak your mind in the north-east corner of the park (near Marble Arch), the creation in 1930 of the Lido for bathing in warm weather, and, more recently, the building of the Diana, Princess of Wales’ Memorial Fountain (unveiled in 2004), and the 7 July Memorial (unveiled in July 2009). Other sculptures in the park include Isis (designed by Simon Gudgeon, located on the south side of the Serpentine), the Boy and Dolphin Fountain (designed by Alexander Munro, it stands in the Rose Garden), and a monumental statue of Achilles, a memorial to the Duke of Wellington designed by Richard Westmacott, near Park Lane. There are also memorials to the Holocaust, Queen Caroline, and the Cavalry as well as a Norwegian War Memorial and a mosaic marking the site of the Reformer’s Tree (the tree was burnt down during the Reform League Riots of 1866). The park has been integral part of any national celebrations for centuries – in 1814 a fireworks display there marked the end of the Napoleonic Wars, the Great Exhibition – with the vast Crystal Palace – was held there in 1851 and in 1977 a Silver Jubilee Exhibition was held marking Queen Elizabeth II’s 25 year reign. Cannons are fire there on June 2nd to mark the Queen Elizabeth II’s coronation and on 10th June for the Duke of Edinburgh’s birthday. Facilities these days include rowing and pedal boats, tennis courts, deck chairs, a restaurant and cafe (the latter based in the Lido) and, of course, some Boris bikes. There is a heritage walk through the park which can be downloaded from the Royal Parks website. First up, we take a look at the Museum of the Order of St John. 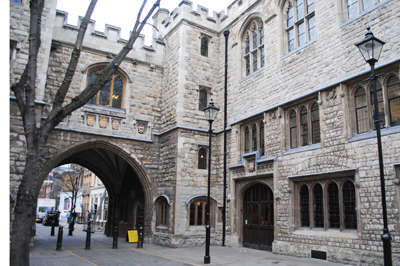 The museum – which was reopened in late 2010 following a £3.7 million redevelopment – is located in St John’s Gate in Clerkenwell (pictured), the Tudor era gatehouse of the order’s once substantial London priory. Told inside is the story of the order, from its founding in the 12th century as the Order of the Hospital of St John of Jerusalem with the aim of caring for sick pilgrims who had travelled to the Holy Land through to its later role as a military order and its Middle Ages moves – following the capture of Palestine by Muslim forces in 1291 – to Cyprus, then Rhodes, and eventually Malta, along with its current work through the charitable foundation of St John Ambulance. Exhibits include weapons and armour, paintings and illuminated manuscripts (such as the Rhodes Missal of 1504), coins, furnishings, ceramics, silverware and textiles. There is also a 16th or 17th century bust of Jean de la Valette, Grand Master of the Knights Hospitaller from 1557 to 1568 and famed for leading the order to victory in the Great Siege of Malta in 1565 (he is remembered still in the name of the island nation’s capital, Valletta). 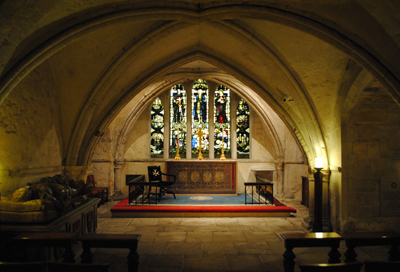 As well as the gatehouse (which, following the Dissolution, was used for various purposes including being the childhood home of 18th century artist William Hogarth and, at another time, housing a printing press used by famed lexicographer Dr Samuel Johnson), the museum’s assets also encompass the 12th century crypt under what was once the priory church (it’s located just to the north across Clerkenwell Road). 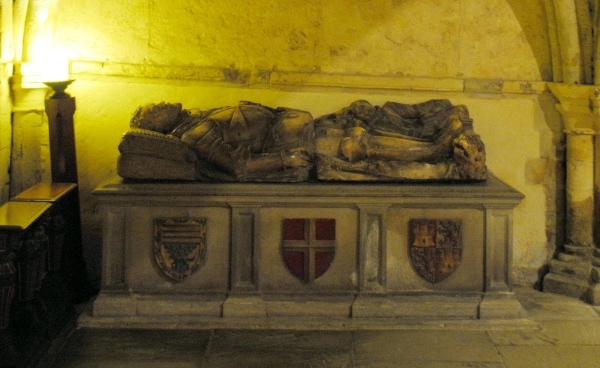 It’s well worth a visit for the stunning 16th century tomb effigies alone. WHERE: The Museum of the Order of St John, St John’s Gate, St John’s Lane, Clerkenwell (nearest Tube stations is Farringdon); WHEN: 10am to 5pm, Monday to Saturday (tours are held at 11am and 2.30pm on Tuesday, Friday and Saturday); COST: Free (a small donation for guided tours); WEBSITE: www.museumstjohn.org.uk.